You probably can't tell by some of my ensembles, but I am typically a pretty laidback person when it comes to going out. I'm not really into the whole-changing-my-outfit deal between work and play and usually will go straight from the office to drinks (or whatever) just as I'm dressed. I got this skirt and it seemed like a fun flippy piece but I didn't want to make a hassle of changing at work for date night (like I needed to lug even more stuff to work). Plus I wasn't entirely too sure it was office-appropriate. So I did what I usually don't do, and bought some extra accessories along so I could make sure I looked office-ready and then switch it up a bit for after-hours. Shoes, bag and piling on some extra jewelry was my ticket. And it all fit into my tote, so I felt like I tried but didn't, you know? What you ladies don't see is my winter which kept me snuggly warm. And the bare legs, while perfectly fine for the warm-ish GA day, was c-c-cold after the sun set. Happy Valentine's Day, ladies! I hope your sweeties spoil you appropriately, regardless of whether or not you're still stuck at home in winter weather purgatory. Have a good weekend. Your skirt may be the cutest thing ever, I love it! Happy Valentine's Day! Love this skirt! And the way you styled it for work is perfect. It looks like two totally different outfits! I really like the striped top with your floral skirt. This is such a cute skirt and I think it is totally office appropriate! I love the sheen in the fabric and the pretty flowers! Its a winner in my book ! you look great - i love the pattern mix and the jacket. That skirt is beyond adorable! I love the shape and print, and your heels are so pretty with it! That skirt is so cute. It's different which I like. Both outfits are great. That skirt is WHAT'S UP. Love it! And that bag is perfect. That skirt is fantastic, and I love both ways that you styled it. Love these little tweaks to go from day to night! And that skirt is just so fun! Hope you had a great Valentine's Day also!! This is a great skirt! I love the mixed prints. I'm with you, I don't like to bring too many things with me from day to night either. When I first read your post, I was thinking "day to night....?" Then I remembered, oh yeah, a lot of people go out after work instead of going straight home and crashing on the couch like me! Haha. Oh no, I go straight home most nights, change into jammies and def crash onto the couch. Nothing like walking my pup at 7pm in my jam pants! Normally I don't care for this type of skirt but now you have me rethinking that. It looks great on you. Great switcheroo for the day to night look too. This silhouette is a hit-or-miss sometimes. It's too easy to look too cutesy! Btw, come check out today’s post on my blog. I nominated you for an award. Please don't feel obligated to do much with it except bask in the fact that you're super cool. I really just wanted to recognize my peeps, and I am honored to consider you one of them. I think you'll dig the skirt - especially since it's like $20 right now! Oh no, I hope that's been resolved (I am not tech-savvy person, so unfortunately I can't help at all) - but I did not do anything differently when I loaded my pics. Sorry! I love how you changed this up! Cute skirt! Flippy and Springy! Love the secret bling with the pinstripes! It looks awesome with and without the jacket. Great way of taking it from day to evening Lisa. Happy Valentine's Weekend to you. I loved it mixed with the stripe and the chic and simple jacket . Great necklace, too! This outfit is to die for! love. Also, what is the lipstick you are wearing? I love the shade! It's Sephora lip attitude #G17 - thanks! Gorgeous look! 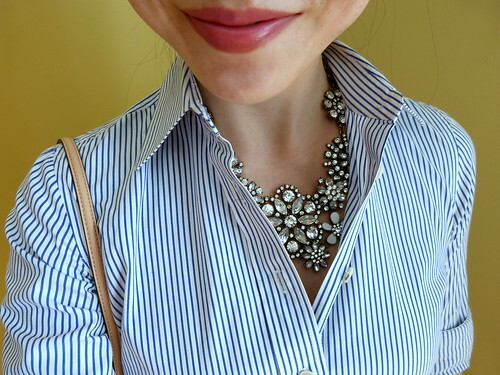 I love the idea of mixing a striped button-up with a flirty, floral skirt. omgosh so cute lisa! that skirt is TO DIE FOR!!! You certainly nailed the sweet flirty look here Lisa....hope you had a fantastic VDay! This skirt is so fun! I love that fun necklace as well. I hope you had a great Valentines! I love this skirt! Jaquard is so fabulous. I love how you paired it with chambray. Super cute skirt! And I think you dressed it really well for the office! That skirt is fabulous. I'm obsessed with it. Love it paired with the pink handbag. 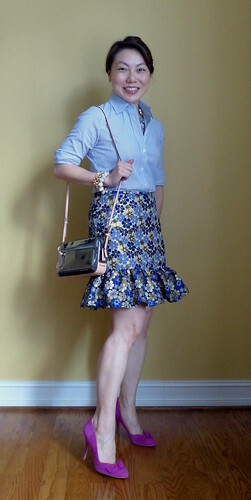 I love this skirt, and how you paired it with a button down shirt! Very nice and cleverly done. A pair of tights (or hold-ups) would not have made much difference in weight. You just didn't think about bringing them along too, did you haha?